Some players try to use every advantage in a game to get ahead, but that makes it difficult to know when you cross the line. One day, I bumped into a friend from another game on a public server. 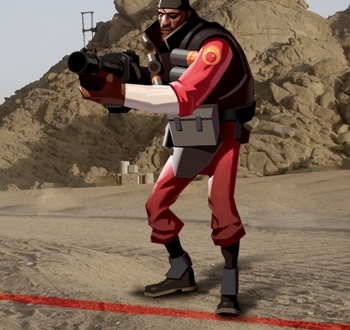 He had been playing Team Fortress 2 since its release, and his main class was the Medic. He only had a few achievements left to complete before getting the final weapon. Looking to help him out, I offered to meet him in an achievement server. His reply caught me completely off guard and forever changed the way I thought about achievement farming: He flat out called me a cheater. Under normal circumstances, it wouldn't have affected me much. However, not only was my fellow Medic a good friend from real life, he was also an admin in a relatively popular MMOG, Yohoho! Puzzle Pirates. Coming from him, his condemnation was not merely a single person's opinion, but that of a person who got paid to enforce the rules of a game. Many gamers hold on to the antiquated belief that if you can perform an action in the game, then it is ok to exploit or use it no matter if it was intended or not. Chu argues that the player himself has a responsibility to understand and interpret a game's rules, but some blame does fall on the developers. If a game studio has an open line of communication with its players that a certain practice is unacceptable, then Chu argues that peer pressure and server banning will auto-correct against cheaters. That sounds good on paper but it will still be hard to see exactly where The Thin Red Line is.